Feeling the pinch of time constraints and wallet woes on Tax Day? Several businesses and restaurants are offering a little relief. Amazon Restaurants: Eat at your favorite restaurant while de-stressing at home. Code EAT7 gets you $7 off your first order with Amazon Restaurants . Bananas Smoothies & Frozen Yogurt: On April 15, get a free small frozen yogurt at Bananas Smoothies & Frozen Yogurt. Just mention the offer at the point of purchase. Available while supplies last. Limit one per customer. See details . B.Good: Get a free green or grain bowl OR a free burger on Tax Day if you download the B.Good app . If you already have the B.Good rewards app, you’ll receive free fries with any purchase on Tax Day. Bite Squad: Use promo code TAXDAY19 when placing an order with Bite Squad on April 15, and pay new delivery fees on orders of $20 or more. See details . BJ’s Restaurant & Brewhouse: Monday’s special is half off any large deep dish or tavern cut pizza. Tax Day will also kick off three weeks of free delivery and no service fees on online orders. See details . Bruegger’s Bagels: The annual Tax Relief Deal is back April 10 to 15 at Bruegger’s . The Big Bagel Bundle (13 New York-style bagels with two tubs of cream cheese) is $10.40 ($3.50 off). To get the offer, join the Bruegger’s Inner Circle rewards program, or claim the offer on Brueggers.com. BurgerFi: Double cheeseburgers are $4.15 on April 15. Limit of one per person. Get the offer by downloading the BurgerFi app . Chili’s: All month long, get the Straw-Eddy Rita (lemons, strawberries, vodka, tequila) for $5 . Denny’s: Get $5 off a purchase of $20 or more with this coupon through April 15.
ezCater: New customers get $50 off on weekday ezCater orders with code ezTaxes2019 through April 17. Farmer Boys: This year’s tax day specials are two double Big Cheese burgers for $10.40 and two breakfast burritos for $10.40. See details . 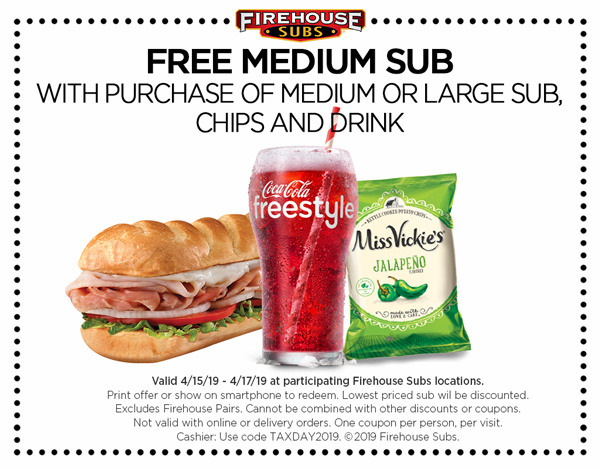 Firehouse Subs: Purchase a full-price medium or large sub, chips and a drink and get a free medium sub . Deal valid April 15 to 17. Use this coupon . Great American Cookies: Stop by a Great American Cookies location on April 15, and get a free Original Chocolate Chip Cookie. No purchase required. See details . Hardee’s: Get a free Made From Scratch Sausage Biscuit while supplies last on April 15. Claim this deal by stopping by Hardee’s between 7 a.m. and 10 a.m. local time and use the phrase “Made From Scratch” when ordering. Tax not included, limit of one per customer. Hot Dog on a Stick: Get one free Original Turkey or Veggie Dog on April 15 at Hot Dog on a Stick. No purchase necessary. See details . Insomnia Cookies: Get a free Traditional cookie with purchase of five Traditional cookies through April 15. Lenny & Larry’s: This company originated the protein cookie and is supplying select H&R Block locations with free cookies. Until April 15, those who come in to select H&R Block locations to file their taxes will receive a free bag (while supplies last) of Lenny & Larry’s The Complete Crunchy Cookies . Mazzio’s Italian Eatery: Get a free dinner buffet with purchase of a dinner buffet and two drinks through April 16. Menchie’s: Download the app by April 15, and get a free $5 frozen yogurt . The Menchie’s Money coupon will show up automatically in the app. Pizza Hut: Get any large two-topping pizza for $5.99 for carryout when ordering online. Deal valid at participating locations through April 15. Schlotzky’s: Get a free small The Original sandwich with purchase of a medium drink and chips on April 15 at participating Schlotzky’s Bakery Cafe locations. See details . Smoothie King: Get $2 off any smoothie April 15 through April 18. To get this deal, download the Healthy Rewards app. See details . Sonny’s BBQ: Get half-priced Sweet & Smokey or House Dry-Rubbed Rib dinners on April 15 (including two Sidekicks and bread), thanks to the IRS (Irresistible Ribs Special) deal. Tilted Kilt: Get $3 Jameson Green Tea shots on April 15 at participating locations. White Castle: Use this printable coupon to get 15% off any order on April 15 (not valid for online orders). Tax Day 2019 retail salesThese retailer sales and free-gifts-with-purchase offers all coincide with Tax Day. Office Depot and OfficeMax: Get free Workonomy shredding services at all Office Depot/OfficeMax retail stores March 31 through April 27. Bring up to 5 lbs of documents and present this coupon . The IRS suggests keeping tax records for three years, so bring in any old returns hogging space in your filing cabinet. Sephora: Until April 17, snag this freebie: Free Urban Decay Eyeshadow Primer Potion trial size with orders over $25. Use this promo code . Tax Day travel dealsTravel companies market vacation deals around Tax Day to appeal to those who want to spend their refunds on a getaway — and to those who need a budget-friendly vacation if their refunds fall short. Hotel Indigo: Hotel Indigo Lower East Side is offering a Tax & Relax package. Book a two-night stay by April 30 and get 10% off all stays through Sept. 4. The package also includes early/late checkout, a complimentary one-category room upgrade and a complimentary $10 daily food and beverage credit. See details . Hotwire: Use promo code TAXGETAWAY15 when booking on Hotwire.com , and get $15 off $150 Hot Rate hotel deals. This deal is valid April 11 to 16. Omni Hotels: The Omni Mount Washington Resort in New Hampshire is offering lift tickets for $17.76 (and a return voucher for next season) on April 15. See details . The Omni Bedford Springs Resort in Pennsylvania, meanwhile, is offering a Tax Day Love deal — get a certificate for a complimentary night to share with a friend when you book on April 15. The certificate is valid for stays between April 16 and Dec. 22. See details . Groupon: Get 20% off tax software .